Chris, I believe churches have to get out of the “If you build it, they will come” mindset. The attractional church usually only pulls in other Christians who are unhappy with their current church. It is not appealing to the lost. The church must go it if it expects the lost to come in. Good post. Excellent post. Isreal was God’s people- a light to the Gentiles whioh was supposed to draw the nations to Christ. The new Isreal is sent into the nations to bring people to Christ. Thanks. Our Chicago suburb requires us to build bridges that people are willing to cross 75% of the new people in our church are unchurched who have been touched through one of our bridge events. We do a combo block/back to school party. It includes live music (80%secular 20% Christian) food and events for the children. We aren’t trying to lead them to the Lord (YET) we just want to become part of their lives, which in turn opens door for sharing the gospel. If a ‘church’ is going to be missional, then I believe they need to get away from the ‘come and see’ and remember the ‘see and go’ or as we call it at Oasis…. drink and go… investing in people without an agenda other than to participate in God’s plan to move onto the next step takes time. I am not talking about friendship evangelism, I am talking about intentional gospel-centered evangelism. Makes perfect sense (now here is the “but”) What if the congregation isn’t willing to re-engage? I see many churches close their doors in my denomination each year because they won’t, can’t, or say they don’t have the “right” pastor (leadership) to do so. Sounds like leadership from within the church (laity) needs to embrace the Holy Spirit’s leading? Thanks for sharing what your church does. Building relational bridges are still important for attractional models as well as churches working the missional culture. I think healthy churches need both. Thanks for pointing out the both/and. I’ve been reading The Tangible kingdom and it contains many of these same themes. Currently planting a church from scratch and working the missional angle as we are still small. 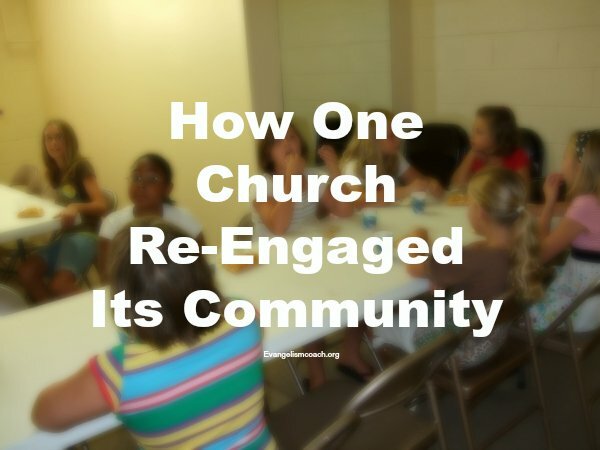 I’ve seen congregations that won’t re-engage. I’ve seen Pastors try to lead, but they don’t want to follow — one party eventually leaves. I’ve seen pastors work to help bring the grumblers along, but Crandalls work shows that after the pastor leaves, the church stumbles again. Thanks all for sharing your thoughts. Keep it up . .
I’m not at all surprised to see that churches that really are engaging their communities and reaching people for Christ are doing some of both. Great post, Chris. Block parties are a great way to reach out in many neighborhoods. The church can help build and restore relationships.